The Creed cowboys are back for the final installment of “First Lady of the West” Linda Lael Miller’s exciting, authentic Western series—the Creed family trilogy. 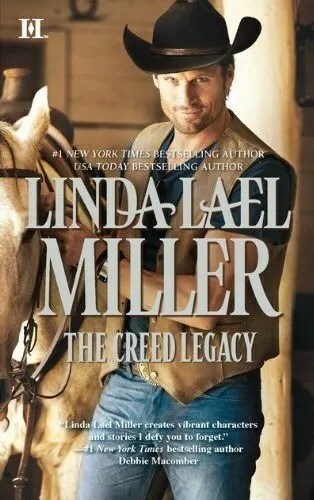 Following the #1 New York Times best-sellers A CREED IN STONE CREEK (March 2011) and CREED’S HONOR (June 2011), THE CREED LEGACY (HQN Books; July 2011; $7.99) ends the beloved three-part series with the story of rough-and-tumble rodeo star Brody Creed, the estranged twin brother of Conner Creed from CREED’S HONOR. Brody likes life on the move. Until a chance encounter with his long-estranged twin brother brings him back home to Lonesome Bend for the first time in years. Suddenly Brody is in Creed territory—at thirty-three, he’s a restless bad boy in a family with deep ties to the land and each other. And Brody has a secret past that haunts him as he tries to make plans for his future. Soon he meets Carolyn Simmons who is looking for Mr. Right as her biological clock ticks. Will she fall for the gorgeous new cowboy in town—the opposite of everything she wants? Yes, I do think opposites attract. But you might be similar in other ways. Yes I do believe "Opposites Attract" Just think back to that first year of marriage, and trying to adjust to each others quirks, just sayin'. I do believe opposites attract. It makes life more interesting when your mate is different than you. Yes I agree opposites attract. Women usually want "bad boys" and men usually want them "wild ladies". Yes, opposites do attract I'm the perfect example I'm not stubborn but my husband is and we're married for 31 1/2 years. Thank you so much for the lovely giveaway opportunity and bring this wonderful author back to my attention. I do believe that opposites attract. My husband and I are about as opposite as we could get and have been married now going on twenty-seven years. Yes, I believe opposites attract, because I've seen it many times. I'm following on twitter @headlessfowl. I follow you publicly on GFC as Helen Keeler. I ABSOLUTELY LOVE LOVE LOVE Linda's work!!!! I do believe that opposites attract. I see it around me all the time. Opposites definitly attract. I would love to read this book. I think they can definitely attract, but would find it very difficult to maintain a relationship over a long period of time. Yes, I do believe that opposites attrack. Please enter me. Thanks! I do believe that opposites attract on some levels in a relationship. Oh yes, I believe. My husband and I are opposites. I do believe it's possible. I sent a request to follow you on Facebook! I do believe in opposites attracting! My husband and I are opposite but we find many things that support our love and marriage. Would love The Creed Legacy!! !